Author: Christina Thornell. Series edited by: Wilhelm J.G. Möhlig. 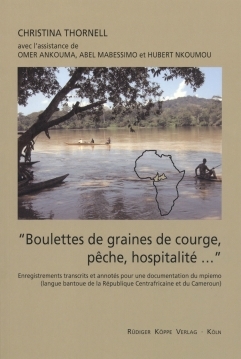 According to Guthrie, Mpiemo is a northwestern Bantu language of the type A.86c, spoken by approximately 29,000 people in the tropical regions of the Central African Republic (c. 24.000 speakers), eastern Cameroon (c. 5.000 speakers) and in parts of the Congo. This language is deeply rooted in its own oral tradition, which is preserved in this publication by way of audio recordings on the accompanying CD-ROM and the respective transcriptions and translations into French reproduced in writing. Narratives and dialogues accurately reflect the diverse aspects of Mpiemo culture. 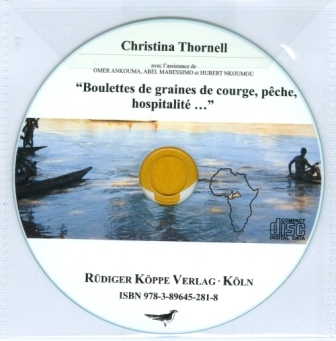 The recordings are all courtesy of a total of eleven native speakers of the Sangha-Mbaéré province in the Central African Republic. The book itself is sectioned into three parts, the first being a short sketch of the sociolinguistic context of the area under description and the methodology used in this work. Parts II and III comprise the actual data and their translations. Using the transcriptions, the reader is able to gain a first look at the narrative structure, the phonetic inventory, morphology and syntax as well as the vocabulary of the Mpiemo language. As such, this collection of texts provides ample material for future linguistics analysis. [...] cette publication, qui se présente dans une collection de « documents », a une présentation très soignée et a bien sûr le mérite de faire connaître une langue peu décrite en en présentant des premiers éléments d’analyse.